Get these great socks to match your sister's, the Wicked Witch of the East's socks. The red and white alternating striped socks measure at 28” and are made of a soft, comfortable material. The rim of the socks has an elastic band to keep them from sliding down your leg. 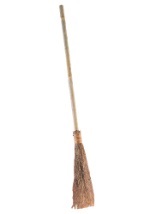 Check out our other great wicked witch Wizard of Oz costume accessories, like green make up, a witchy broom, and recruit your own flying monkey!